Signs have been erected at Coochiemudlo Island’s Main and Norfolk beaches to advise residents and visitors of the presence of Lyngbya (Lyngbya majuscule), a naturally occurring blue-green algae that can cause skin, eye and respiratory irritations if people come in contact with it. 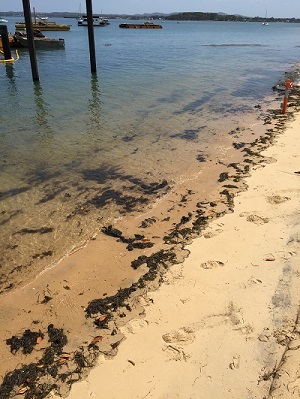 The presence of Lyngbya is not uncommon for waters around the Redlands and Moreton Bay and all Coochiemudlo Island beaches and waterways remain open for recreational use. The signs are precautionary only to inform people of the presence of the material, which often presents as mats floating on the surface of water or as washed-up clumps of on the beach. Swimming and wading is not recommended where algae is present. Council will continue to monitor Coochiemudlo Island as well as beaches at Victoria Point, and will erect signs if Lyngbya is found. More information is available from the Department of Environment and Heritage Protection.